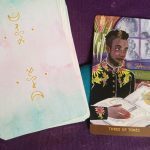 In Queering the Tarot, Cassandra Snow takes the most common interpretations and manifestations of the cards and discusses ways you might read them for a LGBTQQIA2SP+ client – or for yourself. Read the whole series here! Great news, everyone! This series is getting a nice, shiny refinish and heading to book format through RedWheel/Wieser publishing! It’s slated to be out in May 1st, 2019 with a foreword by none other than Beth Maiden herself! You can pre-order at IndieBound right here! The Seven of Pentacles is a card I learned a little bit differently than a lot of people and a card that is radically different whether you’re studying a Thoth based deck or a Rider Waite based deck. The things they all have in common, is that the Seven starts our metaphor that we see through the end of this suit about planting season. In a Thoth-based deck, this is a card about a ruined harvest. In a Rider Waite-based deck it’s a card about how you’ve already done a substantial part of your work. You’ve planted your seeds, and now it’s time to to take a step back and let them grow on their own. I was learning tarot at a harrowing time in my life though. The whole world was new and a bit terrifying, but I knew it was time for me to plant my own seeds and make my own way. The art in the tarot allows for all three of these interpretations, but your deck should make it pretty clear which way it leans. Regardless, this card kickstarts a time of hard work and innovation for the seeker, and also encourages us to take things one step at a time, allowing space for natural growth cycles. As LGBTQ+ people, the Seven of Pentacles can be an exciting but also terrifying time. Whoever we have been and whoever we are are now, now is time to contemplate our next steps. Whether we have seen an attempt at a new life get overturned and ruined, whether we have done the planting and are waiting to see what happens, or whether it is time to start the planting, the Seven of Pentacles will show up assuring us that this is our time and our field to create in. The tradeoff though, is that it’s time to start thinking about the big picture and where we want to be in fifteen years. We all have goals for the next week, month, or year, but the Seven of Pentacles wants us to go a step further and actually focus on the things we hope to accomplish by the end of our lives, but likely haven’t started on. Why specifically do I bring up queer people here? Because it is often later in life, or at least after several journeys of self-discovery that we can even begin to start on those higher goals. We spend the first part of our lives questioning our intuition, our ability to love, our attractions to other people, and our very identities. Then comes all of the analyzing and unpacking and processing. 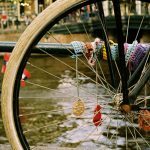 Then comes, most often, a weird period of time where we COULD move on, but we understandably like sitting where we are and just enjoying being queer and happy and healthy. Then, after all of that, comes the Seven of Pentacles. 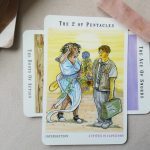 It’s a much different trajectory than our classmates and siblings who are both straight and cisgender, and it means that the Seven of Pentacles is often a surprise for us. We don’t see that day sneaking up where we’re ready to take control and plant the seeds we’ve been carrying with us, but it’s here now, and the card shows up asking what we’re going to do now. That doesn’t mean everything is easy now. Taking control and autonomy of your own life means that you are now responsible for the ups and downs. If that Seven does come as ruin, you and you alone are responsible for righting that. From a queer perspective though, even that is thrilling. This is your time to shine, and your time to make a harvest out of a mess of weeds. If ever there was a queer skillset, the ability to turn that pile of weeds into something beautiful and sustenant would be it. This is what the marginalized spend their whole lives doing–looking at the pile of crap they’ve been handing and scrapping together a worthwhile life. This is all the Seven of Pentacles is asking you to do, and sure it’s exhausting being the one to do it all the time, but this time it’s for you and your life. That’s it. Sure that’s more responsibility and more on you – there are other cards that promise freedom though. This card promises that if you pick up your garden hoe and get to work, the eventual harvest will be more than worth it. Since we’re looking at queer values, this isn’t just about payoff for you. The road you are paving for queer kids who come after you is crucial, and you are more than capable of doing just by finding your own path to what you need. That is balance, taking the bad with the good and learning to find the funny story or the warm hug in the middle of it all.